Christina Kjelsmark holds an MA in social sciences and art history. Though her career as an artist and an art instructor, she gained experience with many different sides of artistic expression. Christina’s own pictures are inspired by the surrounding landscape as well as remote areas such as Africa, Italy, Denmark, Norway, and her “darling” the Faroe Islands. 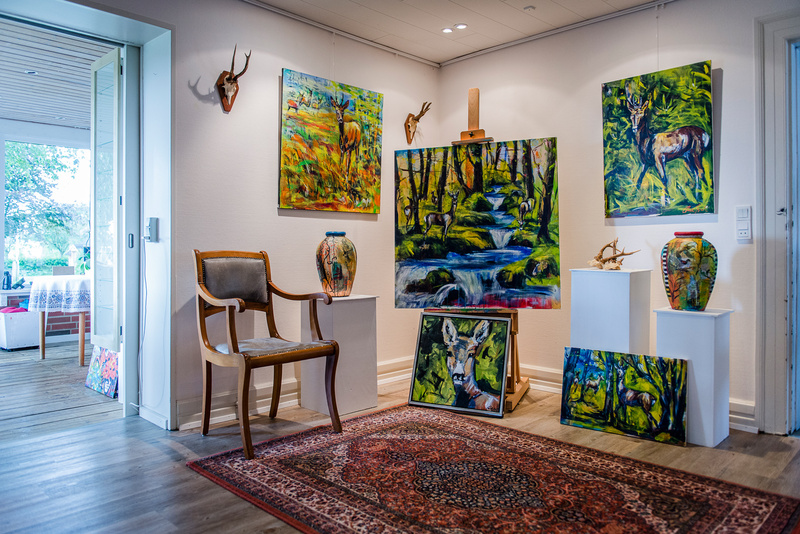 Christinas pictures exhibited at her own gallery but also at several large Danish art houses as well as a gallery on the Faroe Islands. Christina teaches art classes both at the gallery and at regional educational facilities. Besides her work as an artist, illustrator and instructor, Christina has published several books about painting. Christina and her family lives at the farm Sønderbygaard. The owner of Sønderbygaard Christina Kjelsmark have run the gallery “Galleri Sønderbygaard” for a number of years already. All year round you will find exhibitions of Christina’s own work but twice a year the gallery opens its doors to an exciting exhibition of various artists. The exhibition covers both paintings, hand crafts, glass, ceramics and sculptures. To visit the gallery outside of these special exhibitions, we recommend that you call or e-mail the owners to arrange a suitable time.